With the amount of gun laws constantly being proposed and changed at the federal and state levels, it can get confusing trying to keep track of the ones that affect you and your gun rights. Unfortunately, in a notoriously gun-hating state like California, you’ll have to jump through quite a few hoops before you’re allowed to buy and own a firearm. Luckily for you, we’ll go over everything you need to know to navigate the maze of California gun regulations to help you buy a gun and defend your freedoms! Are you sitting down? If you’re reading this on your phone, you might want to sit down before we go any further, because your legs might get tired by the time you’re done reading everything you need to know. 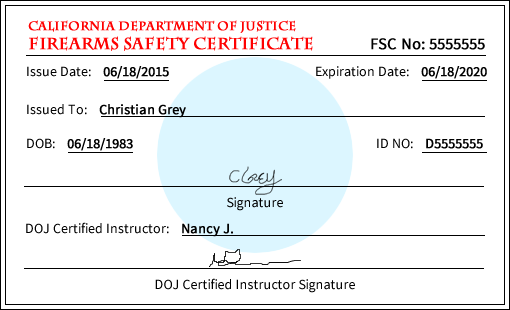 Provide a Firearm Safety Certificate. Doesn’t seem too bad right? The age, ID, and background check requirements are similar to those of other states, since it’s mostly just following the requirements from the federal level. What is different, however, is where things get messy. The state of California decided that its residents had enough to worry about when buying handguns, so it has restricted the types of handguns that can be purchased by civilians. The list of guns, known as the Handgun Roster, is a list of handguns that are approved by the CA Department of Justice (DOJ). The guns you’ll see on the roster are typically older model guns, since the state has placed very strict requirements on new guns that can be added to the list. Basically, all you need to know is that the guns the state allows you to buy are old guns that aren’t even sold anymore in free states like Arizona and Alaska. Want a Gen5 Glock? Here’s a Gen 3 you can buy instead. What this means is that you’ll need to check the Handgun Roster before you head to your local gun store to buy a gun, because there’s a good chance that shiny new gun you saw a review about isn’t available for purchase in California. Once you’ve decided on the gun that you want to buy, you’ll have to go through the next step, the background check. The background check also allows the firearms dealer to record the sale (i.e. keep a record of your firearms purchases), and is more commonly referred to as the DROS (Dealer Record of Sale). No matter whether you are buying from a private seller or your local gun store, you’ll need to have the gun store perform a background check on you. That means, even if you decide to buy someone’s used 1911 on Craigslist, you’ll need to meet the seller at a licensed firearms dealer (usually a local gun store), and have the dealer perform a background check. As part of the background check, you’ll also need to provide proof of residency. This can be anything that shows you are a California resident. Military permanent duty station orders indicating assignment in California. You’ll need to make sure the address on your proof of residency is the same as the address on your driver’s license too, or else it’s no good. Of course, you’ll want to make sure you’re allowed to buy a firearm before you even go through this whole process. Ten- year prohibitions on firearm purchase and ownership apply to anyone convicted of a criminal misdemeanor. Five- year prohibitions on firearms purchase and ownership apply to anyone taken into custody as a danger to himself or others, is assessed, and admitted to a mental health facility. Juvenile prohibitions on firearms purchases and ownership apply to juveniles adjudicated wards of the juvenile court, and cannot purchase or own firearms until they turn 30. Are subject to a protective order. Hopefully none of these apply to you, so you can continue through the gauntlet to buy your handgun! Once you meet the background check requirement, you’ll also have to provide a Firearms Safety Certificate (FSC) to the person doing the background check (i.e. the gun store employee). This certificate is basically a small card that you are given once you pass the Firearms Safety Exam given by the California Department of Justice. The FSC exam is not too difficult, and just goes over the basic firearms safety rules, including safe storage of firearms when not in use. All you need to know is in the California Firearms Safety Guide, that is available from the CA DOJ website. You can take the exam at any local gun store, and need to score at least 75% to pass. On the 30 question test, you can only get 7 questions wrong. If you fail the test, you will need to wait 24 hours before you can take it again. Once you pass the test, you will be given an FSC, which has to be presented when you buy a firearm in California. The downside, in addition to needing a permit from the state to buy a firearm, is that it has to be renewed every 5 years. Hopefully you’ll have come to your senses and moved out of California by the time you need to renew anyway. Fortunately, there are some exceptions to having the FSC. If you are a military or peace officer, or retired peace officer, you won’t have to provide an FSC when you buy firearms. Anyone who is licensed to carry concealed in California also does not have to present an FSC. Instead, you’ll need to show your CCW permit when you buy a firearm. Once you’ve done all of that, you’re good to go! Sort of. After paying for your handgun, you’ll actually need to wait 10 days before you can pick it up. And of course, this applies to both guns purchased from the store, and one that you bought from a private seller. There is no exception to this waiting period, even if you have already purchased guns previously. After the 10 days, you can go to the gun store and pick up your handgun. Well, almost. You’ll have to do one last step of going through a safety handling demonstration. 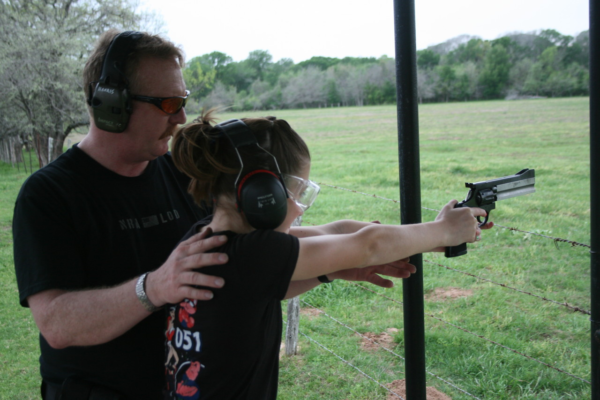 Essentially, you’ll need to show that you know how to unload and load your firearm in a safe manner. Of course, depending on the type of handgun you buy, the steps will be slightly different. Place any locking devices back on the firearm if necessary. If you are in the military or are a peace officer (or retired peace officer), then you can avoid having to go through a safe handling demonstration. Saves you a few minutes, I guess. For those of you still paying attention, you’ll notice the safety demonstration mentioning locking devices. All firearms purchased in California must have a CA DOJ-approved safety device. This is either a trigger lock, or some other type of lock that makes the firearm unusable when the device is engaged. The requirement is not a big deal, except that every firearm purchased has to have a safety device. If you buy a new gun from your local gun store, the manufacturer usually includes a locking device with the gun. If you are buying a gun through a private sale, however, you will need to either have a locking device from the seller, or provide your own. Unless you can provide evidence of an approved gun safe, you’ll need to show that you purchased a firearm safety device in the last 30 days. That, or you’ll have to pony up and buy one from your gun store on the spot. Once you jump through all of those hoops, you can finally take your handgun home! If this all sounds like a hassle, then you could at least make it less painful by just buying a bunch of handguns each time, right? Absolutely not. You can only purchase one handgun every 30 days. This does not mean you can start the DROS on the next handgun you want to buy 21 days after you pick up your first handgun. You have to wait until the 31st day after the initial DROS before you can even start a new DROS process. The good news is that this only applies to the new handguns you buy from the gun store. You can buy as many handguns as you want, as often as you want, as long as you can find private sellers who are willing to sell to you. The process for transferring your firearms to family members is not as bad as a typical purchase, fortunately. If you are transferring a firearm between family members of the “immediate family”, then you do not have to have a background check done. Your “immediate family” includes your spouse or domestic partner, parents, children, grandparents, and grandchildren. However, your siblings are not included, for whatever reason. Keep in mind also, that the person you are transferring the gun to will need to have an FSC. Even with this transfer, however, you’ll need to report the change of ownership within 30 days of the transfer, by reporting it to the CA DOJ, usually through their website. It’s also important to keep in mind that anyone under 18 is not allowed to even possess a handgun or live ammunition except in very specific instances. A person under 18 can possess a handgun or live ammo only if the minor is accompanied by his parent or legal guardian, or is accompanied by an adult and has written permission from his parent or legal guardian, and is participating in sporting, ranching, hunting, or a movie, tv or other entertainment event. If you want to just borrow a firearm from a friend, you will need an FSC also. If you are only borrowing for three days or less, and the person loaning you the gun is in your presence during the entire time, then you do not need an FSC. After going through all of that just to buy a handgun, you might as well go all the way and buy some long guns while you’re at it. Long guns include shotguns, and of course, AR-15s. If you’ve got questions about AR-15s you already own and if they are “assault weapons”, we’ve got you covered later on in this guide too. Provide a Firearms Safety Certificate. Basically, the main differences are that you don’t need to provide proof of residency when it comes to buying a long gun, and you can buy it when you turn 18. The other upside to buying a long gun is that you are not restricted to buying a long gun every 30 days. You can buy as many as you want, as often as you want! In fact, if you are buying a handgun, you might as well buy a long gun while you’re at it. You’ll still have the 10-day waiting period just like with the handgun, so you might as well pick up both while you’re at it. Good news! As long as you are buying an antique firearm of a replica of one, you don’t have to go through the obstacle course you normally would in buying a gun. You’ll need to be absolutely sure the firearm qualifies as an antique, however. A muzzle loading rifle, shotgun, or pistol, which is designed to use black powder and cannot used fixed ammunition. 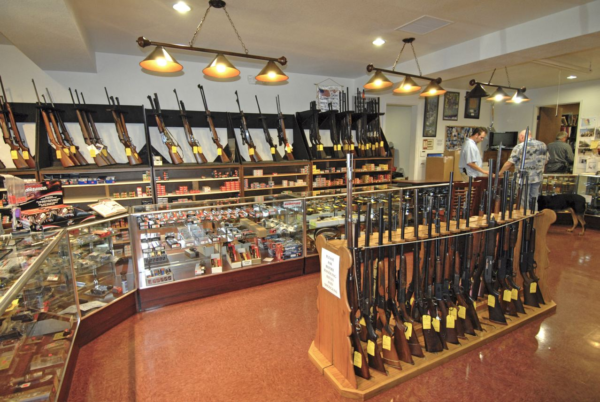 If the gun you want to purchase meets the requirements under either 1, 2, or 3, then it will qualify as an antique firearm, and not require any of the steps you have to go through for a buying a firearm in California. Once you’ve finally made it and have your firearms in hand, you might be tempted to show them off around town. Generally in California, this is a bad idea, unless you really like spending time in jail and having your firearms confiscated. To carry your guns, either openly or concealed, you’ll typically need a permit, unless you’re at home, on a campsite, or on private property you own. If you are hunting or fishing, however, you are allowed to carry a concealed handgun, as long as you are licensed to hunt or fish. However, you cannot carry or transport loaded firearms while you are on your way to or from your hunting or fishing trip. Basically, you can only carry your concealed handguns when you are actually at the hunting or fishing location. For anyone interested in getting a CCW permit, you’ll want to hop on over to our CA CCW page after you’ve finished up here. You’ll also need to be careful when you transport your firearms in the car. Handguns must be unloaded and locked in the trunk of the car, or in a locked container. Locked by a padlock, key lock, combination lock, or other type of locking device. A locked container does not include a locked utility or glove compartment. If you’re transporting non-concealable firearms, like your long guns, they are not required to be transported in a locked container. They do have to remain unloaded, however. And for those of you with what California classifies as “assault weapons”, they must be unloaded and stored in a locked container when transported, and can only be transported between specific locations (i.e. your home and the shooting range). Even if your “assault weapon” is a long gun, you’ll have to keep it locked up. So what exactly is an “assault weapon”? California has a very specific set of features that, if found on a rifle, will legally classify the rifle as an “assault weapon”. Once a rifle is considered an “assault weapon”, it must be registered with the state, and you’ll have to follow specific laws, if you ever want to transfer it or do anything other than hold on to it. Make the weapon permanently inoperable. What you cannot do is transfer the assault weapon to anyone else, whether it’s family or friends, or some guy who answered your Craigslist ad. And you can’t will it to someone upon your death, either. The state will seize the weapon at that point. As of 2017, you are required to register your assault weapon with the state of California. You have until June 30, 2018 to complete the registration. How do you determine if you have an assault weapon? There are three categories of assault weapons in California. The first category is just the list of all the firearms on the Roberti-Roos assault weapons list. This is the list that was created under the Roberti-Roos Assault Weapons Control Act of 1989, and required the weapons to be registered by March 31, 1992. If you had one, it’s probably registered by now. I hope. The second category of assault weapons are all the firearms listed in the AK and AR-15 series of firearms. There are too many to list, but all you need to really know is that if you bought a rifle from your local gun store, it probably wasn’t an assault weapon. Unless the “gun store” was more of a “back of a guy’s van”. In which case, you need to turn that thing into the police ASAP. The third category of assault weapons is where most rifle owners will need to pay attention. A pistol grip that protrudes beneath the action of the weapon, a thumbhole stock, or a vertical handgrip. You’ll want to focus on the first definition. Up until now, there was a “bullet button” that was attached to AR-15s that allowed the rifles to get around the “assault weapon” definition. New laws were passed recently, however, that cover AR-15s with bullet buttons, too. The only way around the “assault weapon” definition now is to make sure you either do not have any of the features a-f under assault weapon type 1, or you will need to have a fixed magazine. A fixed magazine means the magazine cannot be removed without disassembling the rifle. 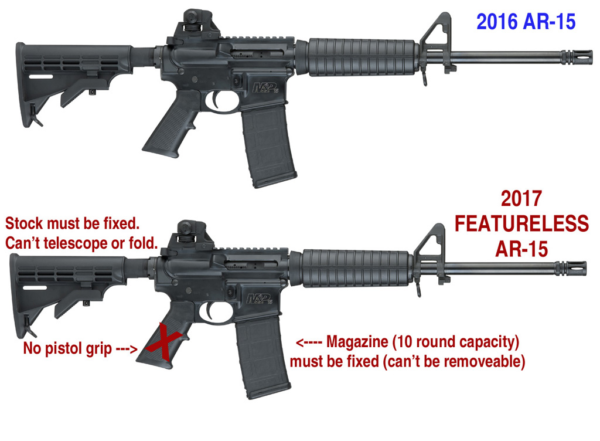 Under the new law, the bullet button allowed for the magazine to be removed while keeping the rifle intact, and so would still qualify as an “assault weapon”. 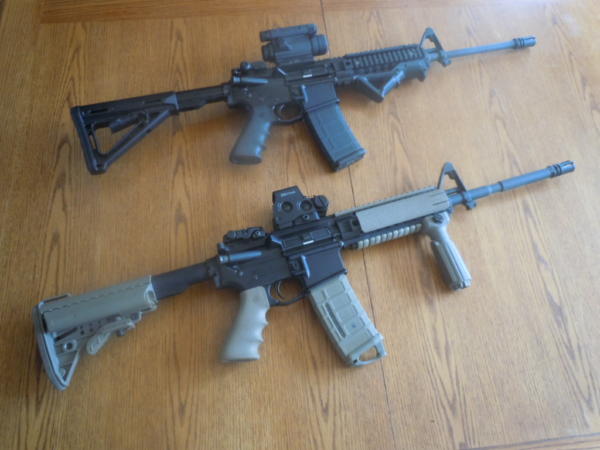 For those of you who aren’t interested in registering your rifle with the state, check out our article on featureless AR-15s to find out how you can stay in compliance with the laws, but still have a somewhat usable rifle. There are also new version of the bullet button, which essentially open up the rifle, and require it to be disassembled, before the magazine can be removed. It’s not a great solution, but it means you won’t have an “assault weapon” in your hands. For everyone else that’s ok with registering, take a look at the article anyway to see if you’re willing to make those changes to your rifle and keep yourself off the registry! Aside from being able to shoot at the range and while you’re out hunting, the only other time you’ll be able to use your firearms is in very limited instances of self-defense. California, surprisingly, does have laws on the books that allow for the use of deadly force in self-defense situations. 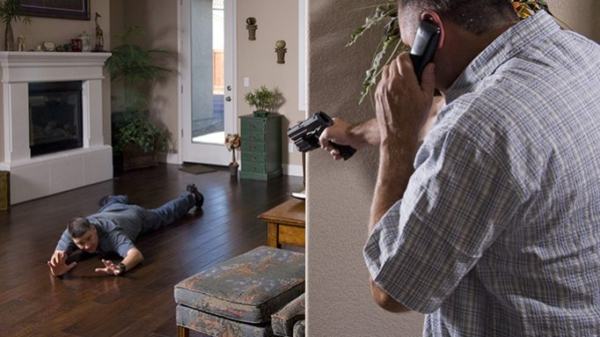 Under what is commonly known as the “Castle Doctrine”, you can use deadly force to defend yourself when you are in your home, aka, your “castle”. You acted under the belief the deadly force used was necessary to save yourself or another person from death or a life-threatening crime. BUT, this right of self-defense immediately ends when there is no further danger from the person. In other words, if the initial attacker is now incapable of committing further crime or causing any more injury, you can no longer use deadly force to defend yourself. What that means i that, you can use deadly force to defend yourself if someone breaks into your home and you reasonably believe he is going to commit a life-threatening crime, but once he turns around and starts running out the door, you will no longer be allowed to use deadly force. Anything after that point will not be considered justifiable self-defense. It’s also important to know that California does not have a “stand your ground” law on the books. So if you are licensed to carry your firearm outside of the home and you are somewhere you are legally allowed to be (i.e. a restaurant, a ball game, etc. ), and are faced with a life-threatening situation, you cannot engage the threat, and must instead retreat from the situation. Deadly force is not allowed here, since the threat is neutralized. California also has a ban on “large capacity” magazines, and a few surprises for new residents. In free states, magazines that hold more than 10 rounds are known as “standard magazines”. In California, however, any magazine capable of holding more than 10 rounds is considered a “large capacity” magazine, and is illegal to own, buy, sell, or pretty much even look at. 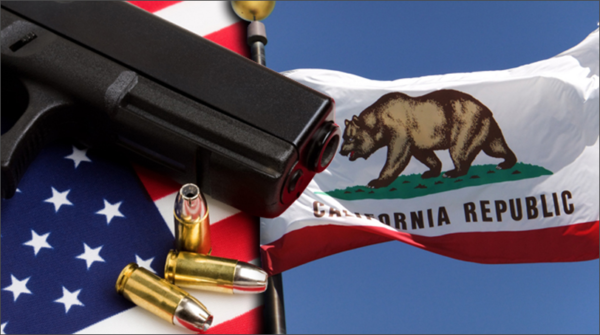 As a welcome gift, California requires anyone moving to the Golden State to register with the CA DOJ, all firearms they brought with them, within 60 days of moving into the state. If you have any magazines that hold over 10 rounds, then you’ll need to either leave them out of state, turn them in to the police, or destroy them. If you somehow managed to get your hands on firearms even with all the requirements set out by the state, then you’ll need to make sure you store them in a safe manner. 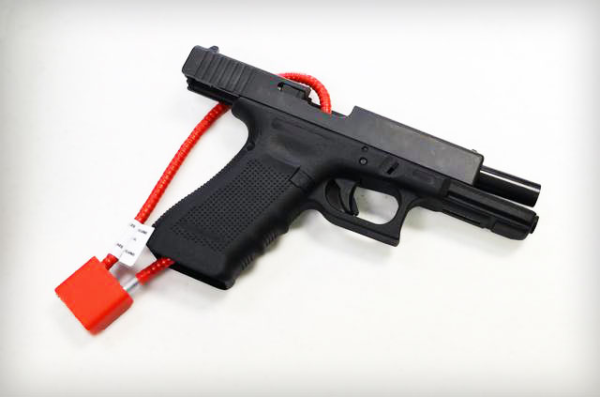 Basically, you are required to keep your firearms in a locked container or secured with some type of locking device that keeps the firearm from functioning. This can be either trigger locks, cable locks, lockboxes, or gun safes. 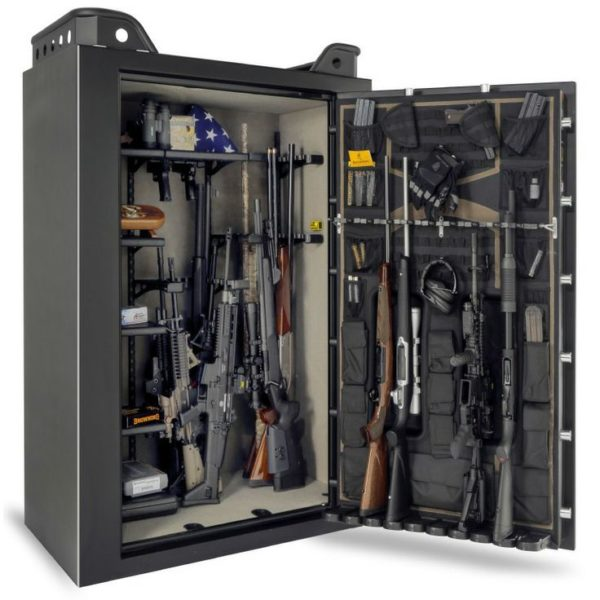 As long as the gun safe is CA DOJ approved, you should be good to go. Finally! Hopefully all of those restrictions haven’t discouraged you from trying to buy a gun in California. If anything, it should encourage you to try and buy as many as you can!